Our practice is focused on these imbalances because they continue to be some of the most misdiagnosed, misunderstood and underserved illnesses facing modern humans due to a medical establishment and natural practitioner community that simply doesn’t know how to treat them. It doesn’t have to be this way. 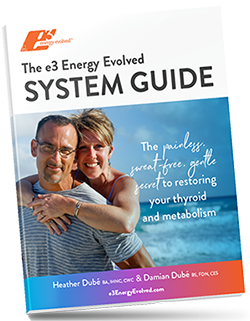 Too often with autoimmunity and thyroid imbalances, patients are over-tested and “under-resulted,” meaning the practitioner doesn’t truly know how to read the test results, fails to spot patterns and critical clues about the condition and therefore can’t chart an effective restoration course for the patient. That’s what’s so different about e3 Energy Evolved. We know how to interpret your unique symptoms, approach you as a whole human—and guide you through the physical, mental, emotional and spiritual dimensions that all affect your wellness. While our professional training is in diagnostic nutrition, functional medicine and psychology, our passion for resolving autoimmunity, thyroid imbalance and chronic fatigue comes from our own harrowing personal experience, which gives us deep empathy for all those on a healing journey. You can read about it here. We’d love to introduce ourselves, hear your story and give you an e3 Energy Evolved Functional Health Assessment to move your physical restoration forward. Our assessment is a comprehensive clinical discovery process that will uncover your untapped healing opportunities through our nutrition, diagnostics, psychology, stress, metabolism, movement & detoxification expertise. Learn more and schedule your assessment on our Work with Us page.